Sew a Fat Quarter-Sized Fold Up Basket! This was our Pinterest UnTutorials project for January 2017, and I had so much fun making lots of baskets! First I had to decide what size basket to sew. I wanted a size that would be easy to handle, fast to make, and wouldn't waste fabric... the fat quarter size was perfect! And look... they are perfect for holding patterns, pieces of a project in progress, and pom-poms too! The finished dimensions are approximately 5 3/4'' tall, 5 3/4'' wide, and 7'' long. Plus these baskets are totally reversible. To make things easier for you, I tested 2 different kinds of stabilizer (Peltex 72F and Soft & Stable), plus I tried out 3 different methods for finishing the edges. Every basket turned out cute, so I'll just show you what I think of each, and you can sew yours the way that you want! This basket was sewn with Peltex 72F (ultra-firm, double sided fusible stablizer). I finished the edges with a zig-zag stitch on my sewing machine. It's firm and sturdy, and the edges fray less than the one with straight-stitched edges. This basket was sewn with Soft & Stable stabilizer from ByAnnie's. If you love that stabilizer, then I suggest substituting the Pellon version, Flex Foam 2 sided fusible, because unfortunately Soft & Stable doesn't come in fusible varieties. This basket is soft but still plenty sturdy enough to stand up. I finished the edges on this one with a 3-thread balanced stitch on my serger (only one needle so I could turn the inner corners). It was tricky to serge the inner edges of the flaps. I had to raise my knife 4 times so I wouldn't cut into the bottom of the basket. My Juki MO-1000 serger lets me raise and lower the knife easily mid-project, so that wasn't a problem. I'd only recommend finishing the edges this way if you are comfortable with your serger. This one also has the Peltex 72F (because I liked the double sided fusible stabilizer better), and I finished the edges with a straight stitch. It looks really cute, but it frays quite a bit. If you don't mind the fraying, the straight stitch finish is the fastest and easiest. Are you ready to sew an adorable basket? Grab 2 fat quarters and let's go! 1. Trim the fat quarters to 18'' x 20'', to match the piece of stabilizer. 2. Smooth out one piece of fabric on the stabilizer and iron over it very lightly to secure the fabric to the stabilizer without fusing the other side of the stabilizer to your ironing board. 3. Smooth the other piece of fabric over the opposite side of the stabilizer. This time press slowly, with lots of heat and steam until the fabric is completely fused to the stabilizer. 4. Now turn back to the first side and press slowly and with lots of heat and steam until it is completely fused too. Don't worry if all 3 pieces (the 2 fabrics and stabilizer) are perfectly aligned at this stage. if they are off by 1/4'' or less on any side, you will be able to trim everything to look right in the next step. 1. Trim your fused piece down to 17 1/4'' x 19 1/2''. Cut away the side(s) that are unevenly fused first, and then trim it to the right size. 2. Using the fabric pen or marker (make sure the ink will disappear later), draw a line 5 3/4'' away from each edge. 3. Sew straight lines along all 4 lines that you drew. 4. 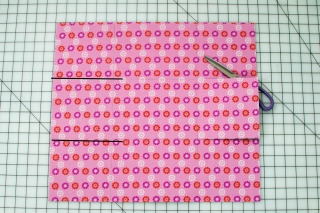 At the sides, cut right over your horizontal stitching lines until you reach the vertical lines. Stop cutting before you cut into the vertical lines. This will make 3 flaps on each side. 5. Using the fabric marker again, draw horizontal lines on each of the 4 corner flaps. These lines should be 1 1/2'' from the top and bottom edges of each flap and 1/2'' from the sides. 6. These lines are cutting lines, so stitch around each one of them about 1/8'' away from the line. Backstitch over your starting point to secure the stitching. 7. After sewing around each of the short horizontal lines, cut them open without cutting into the stitching. I like to start with my rotary cutter and then carefully finish with my scissors. 8. Referring to the white dashed lines in the photo above left, trim the center side flaps. Cut in about 3/4'' away from the edge on either side, and then angle in to the corner. Do not cut the stitching. 9. Finally, finish the all the edges on the basket, including around the flaps. You can choose a straight stitch 1/8'' from the edges as seen here, or you can zig zag over the edge. Here you can see my short zig zag stitch that was very close together. This is also called a satin stitch. I also used a zig zag stitch around the slashed opening here, but I didn't like that very much. Or you could serge around the edges. As I mentioned, that's the trickiest finish. I recommend using only 1 needle (3 threads) and you must be able to lower the knife as you approach the inner corners. To use the basket, fold two corner flaps together, and weave the trimmed flap up through the slots on both at the same time. Repeat on the other side. If you make some, I'd love to hear which stabilizers and techniques you used, and what you use them for! You could also upload a picture to a Show Off Saturday picture party.